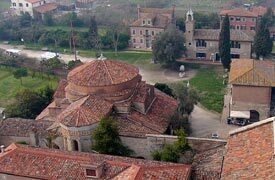 There was a time, nearly 1,500 years ago, when Torcello was the largest and most important settlement in the Venetian Lagoon. Those days are long gone: As silt from rivers on the mainland filled up the shallow waters around Torcello, trade became more difficult and malarial mosquitoes bred. The 20,000 or so inhabitants gradually made their way to Venice, and today only a few dozen innkeepers, farmers, and other hardy souls live on the largely abandoned island. Still, it's obvious even from the Burano waterfront that Torcello is worth a visit: A magnificent Byzantine-Italian cathedral dating back to 639 A.D., the Basilica of Santa Maria Assunta, looms over the island with the Bell Tower and Church of Santa Fosca alongside. Allow 45 minutes or an hour to visit the religious buildings around the central piazza, which is a short walk along a canal from the ACTV pier. Tickets are sold individually for the Basilica, the Bell Tower, and the small Archaeological Museum, but the best deal is a combination ticket that includes all three plus the use of an audioguide in the Basilica (still called the "Cathedral" by many, and still in use for weddings and religious festivals). Don't let claustrophobia or a fear of steep stairs keep you from ascending the Bell Tower: The climb is easy, via a series of gentle well-lit ramps, and from the top you'll get a fine view of the church buildings, the island, and the Lagoon. From about 7 to 9 a.m., a small No. 9 boat often provides morning commuter service between Burano and Torcello, depending on the season.